Marc Marquez shattered the lap record today at Indianapolis to take pole position as he dominated the rest of the field on his Repsol Honda. 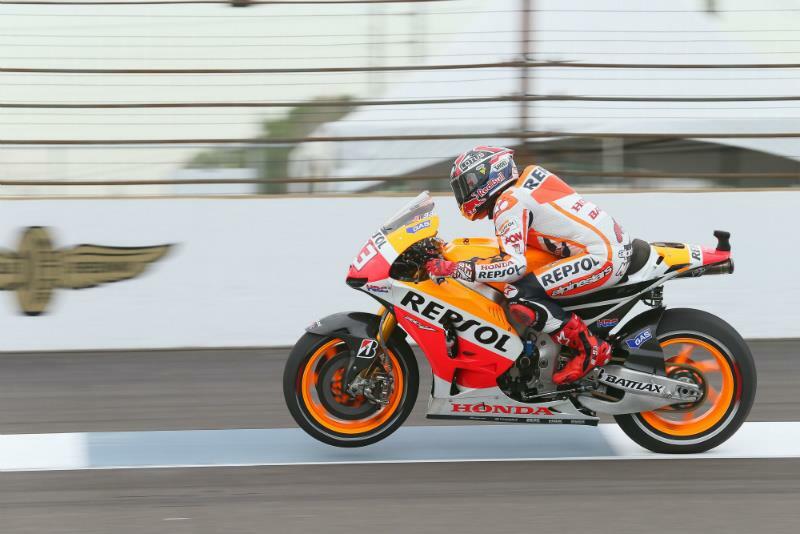 The championship leader, still in his rookie year, beat the lap record set by Dani pedrosa last year by 0.8, to finish half a second faster than second placed Jorge Lorenzo. Pedrosa, previously dominant at the American circuit, was third, still recovering from a damaged shoulder, while Cal Crutchlow took his place as perennial best privateer to put his Tech 3 Yamaha fourth. Alvaro Bautista was fifth, while Nicky Hayden was the best American, putting his Ducati on sixth spot. THe third row was headed by Bradley Smith, ahead of Stefan Bradl, after a fall at turn one ruined his weekend-long run of top threes. Arguably the most disappointed rider of the day will be Valentino Rossi, languishing back in ninth after a disaster of a session. Rossi has been struggling with corner turn-in issues all weekend on his Yamaha M1. The second factory Ducati of Andrea Dovizioso was tenth, with Andrea Iannone on the sole privateer Ducati after a crash for Ben Spies this morning forced him out of the rest of the weekend's activities. Colin Edwards made it through from Q1 for the first time this season at one of his home races to take the final grid spot of Q2.